Mark Smith, Chief Executive Officer for Largo, stated: "2018 was an outstanding year for Largo as it delivered extremely robust financial results with net income of $316.0 million while also consecutively increasing quarterly production at the Maracás Menchen Mine allowing the Company to exceed its production guidance midpoint by 2%." "We entered 2019 in a very solid financial position with a cash balance of $206.2 million and the Company currently has approximately US$29.1 million of outstanding debt with plans to eliminate this remaining debt balance in early June 2019. Largo continues to remain one of the lowest-cost producers of vanadium in the world which allows the Company to generate significant amounts of cash in the current vanadium pricing environment. We look forward to continuing the successes of 2018 and it is our goal to maximize organic value creation at the Company in 2019." He concluded: "Largo's Board of Directors is examining alternatives for the return of capital to its shareholders in the form of share buybacks and/or dividends as well as using its excess cash and cash flows to finance the potential further expansion of its high-quality vanadium Maracás Menchen mine in Brazil. Acquisitions of other companies or mining projects are not part of Largo's current strategy." Total production from the Maracás Menchen Mine in 2018 was 9,830 tonnes of V2O5, exceeding the Company's production guidance midpoint by 2%. This represents an increase of 6% over 2017 and is the strongest full year of production from the mine since operations commenced in 2014. The Company also achieved a new quarterly production record in Q4 2018 with 2,595 tonnes of V2O5 produced, up 1% from the previous quarter and representing the fourth consecutive quarter of production growth during 2018. Global V2O5 recovery rates averaged 77.0% in 2018 representing an increase of 1.7% over the year prior. Recoveries of 75.3% in Q4 2018 averaged lower when compared to 79.4% in Q4 2017 due to issues with kiln stability. Sales of V2O5 during Q4 2018 were 2,520 tonnes, including 360 tonnes of high purity V2O5. Total high purity V2O5 sales in 2018 were 1,440 tonnes and the Company remains focused on developing premium products with the commissioning of the high purity and powder screening and packing automated systems completed during Q4 2018. The expansion project to achieve production of 1,000 tonnes of V2O5 per month is progressing as planned with a target completion date of the end of Q2 2019. The Company anticipates the expansion ramp-up to be completed during Q3 2019 and expects to reach the increased nameplate production rate of 1,000 tonnes of V2O5 per month from the beginning of Q4 2019 and onwards. As a result of additional equipment specification changes to maximize operational reliability, the Company anticipates that its total expansion capital expenditures will be in the range of US$18.0 million to US$21.0 million, an increase from the approximately US$15.5 million forecasted last year. Subsequent to Q4 2018, production in January 2019 was 816 tonnes of V2O5, with 735 tonnes of V2O5 produced in February. Production in January 2019 was slightly impacted by maintenance in the fusion section of the plant and an unanticipated power shut-down at the end of the month. Production in February was impacted by a number of unanticipated power outages and corrective maintenance on the fusion pan conveyor. Small kiln refractory replacements were completed during both months to fix hot spots and maintain operational stability. At the end of February, the Company had AMV stock and work-in-process inventory of 326 tonnes to help mitigate the impact of the kiln shutdown in March 2019 and as a result has gained 4 days of production. The Company's latest estimate is that there will be no production on 13 days during the shutdown rather than the 17 days which was previously reported. As a consequence of this shutdown, the Company expects that cash operating costs excluding royalties10 for Q1 2019 will exceed the Company's guidance for 2019. The Company reported extremely robust net income of $316.0 million and basic earnings per share of $0.61 in 2018 after the recognition of an income tax expense of $27.5 million and deferred income tax recovery of $20.8 million. This represents a significant increase over the year prior and is the strongest year of net income in the Company's history. The Company also reported a net income of $108.0 million in Q4 2018 compared to a net loss of $0.3 million in Q4 2017. The Company's cash balance was $206.2 million at the end of 2018. The Company recognized record revenues in 2018 of $521.4 million, compared to $167.7 million in 2017. This constitutes a 211% increase over 2017 and is the highest recorded revenue by the Company for an annual period to date. The significant increase in revenues over 2017 is primarily attributable to an increase in V2O5 prices and record production achieved in 2018. Revenues in Q4 2018 were $177.5 million being a 262% increase over Q4 2017 and a 19% over the prior quarter. Cash provided before non-cash working capital items was $403.2 million in 2018, an increase of $336.1 million over 2017. Net cash provided by operating activities was $352.1 million in 2018 as compared to $58.6 million in 2017. Operating costs in 2018 were $135.7 million compared to $120.4 million in 2017 and include direct mine and mill costs of $82.0 million, depreciation and amortization of $31.0 million and royalties of $22.7 million. In 2017, depreciation and amortization was $33.2 million and royalties were $6.7 million.The increase in royalties in 2018 is primarily attributable to the increases seen in revenues. Cash operating costs11 in 2018 were $5.45 (US$4.19) per lb compared to $4.72 (US$3.60) in 2017 and cash operating costs excluding royalties14 were $4.41 (US$3.38) per lb compared to $4.40 (US$3.35) per lb in 2017. In Q4 2018, cash operating costs were $6.16 (US$4.66) per lb, compared to $4.53 (US$3.57) per lb for Q4 2017. Cash operating costs excluding royalties14 were $4.60 per lb (US$3.48), compared to $4.14 (US$3.26) per lb for Q4 2017. The increase seen in Q4 2018 as compared to Q4 2017 is largely due to significantly higher HFO prices and the loss of the Reintegra tax credit. Cash operating costs14 of US$4.19 per lb in 2018 is just outside of the Company's guidance of US$4.15 per lb. The average price per pound of V2O5 was approximately US$18.30 for 2018, compared to approximately US$6.52 for 2017. In January 2019 the average price per lb of V2O5 was approximately US$16.28, significantly lower than the average price per lb of V2O5 of approximately US$24.53 seen in Q4 2018. As a consequence, the Company expects to see a significant negative re-measurement of trade receivables as part of its reported revenues in Q1 2019. Debt repayment continues to be a priority for Largo as it aims to eliminate all remaining outstanding debt in early June 2019. On February 19, 2019, the Company completed the repurchase and retirement of an additional US$4.5 million in aggregate principal amount of its 9.25% Senior Secured Notes due in 2021, plus premium and accrued interest, at a redemption price of 105.625%. Since May 2018, the Company has repaid approximately US$120.9 million of its outstanding debt representing a significant decrease of 80.6% and its current outstanding debt balance is approximately US$29.1 million as of February 19, 2019. The Company's ongoing 25,000 metre exploration program for 2019 is progressing well and the Company looks forward to providing an update to the market in early Q2 2019. On December 19, 2018, the Company announced that it had significantly extended vanadium mineralization at the Novo Amparo Norte deposit ("NAN") by 130% to 1.84 km in strike length. In January, the Company initiated this years' exploration program with four drill rigs, following up on the results at NAN received in December. To date, the Company has completed an additional 47 diamond drill holes (5,400 metres) of drilling, primarily focused on increasing the confidence of the resource category within the deposit. Drilling has also begun on the Novo Amparo target, with the aim to increase the size and confidence level of the current inferred resource. Full analytical results are expected soon, at which point the Company will begin work on a new resource estimate. 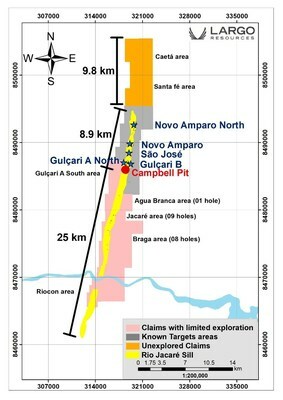 NAN lies approximately 6.5 km north of Largo's current mining operation at the Campbell Pit and the Novo Amparo deposit is located 2.8 km south of and along strike from NAN. Including NAN, the company has identified and drilled seven vanadium rich magnetite zones (the "Satellite" deposits) in the Jacaré Sill north of the Campbell pit. The Satellite deposits will see the majority of exploration work in 2019. South of the Campbell Pit, the Rio Jacaré sill has been identified over a strike length of approximately 25 kilometres. This area has seen little focused exploration efforts to date and there remains significant exploration opportunity both north of NAN, and south of the Campbell Pit which the company will focus exploration activities on over the coming years. Largo Resources' management will host a conference call on Wednesday, March 27, 2019, at 10:00 a.m. EDT, to discuss both operational and financial results for the fourth quarter 2018 and 2018 annual results. The information provided within this release should be read in conjunction with Largo's annual consolidated financial statements for the years ended December 31, 2018 and 2017 and management's discussion and analysis for the year ended December 31, 2018, which are available on our website at www.largoresources.com and on SEDAR. Mr. Paul Sarjeant B.Sc. P.Geo., Manager of Geology at Largo Resources is a Qualified Person as defined under National Instrument 43-101 Standards of Disclosure for Mineral Projects and has reviewed the technical information in this press release. Neither the Toronto Stock Exchange (nor its regulatory service provider) accepts responsibility for the adequacy or accuracy of this release. Disclaimer: This press release contains forward ‐ looking information under Canadian securities legislation. Forward ‐ looking information includes, but is not limited to, statements with respect to timing for and completion of the Marac á s Menchen Mine expansion project and the costs associated therewith; Largo's development potential and timetable of its operating, development and exploration assets; Largo's ability to raise additional funds as may be necessary; the future price of vanadium; the estimation of mineral reserves and mineral resources; conclusions of economic evaluations; the realization of mineral reserve estimates; the timing and amount of estimated future production, development and exploration; costs of future activities; capital and operating expenditures; success of exploration activities; mining or processing issues; currency exchange rates; government regulation of mining operations; and environmental risks. Generally, forward ‐ looking statements can be identified by the use of forward ‐ looking terminology such as "plans", "expects" or "does not expect", "is expected", "budget", "scheduled", "estimates", "forecasts", "intends", "anticipates" or "does not anticipate", or "believes", or variations of such words and phrases or statements that certain actions, events or results "may", "could", "would", "might" or "will be taken", "occur" or "be achieved". All information contained in this news release, other than statements of current and historical fact, is forward looking information. Forward ‐ looking statements are subject to known and unknown risks, uncertainties and other factors that may cause the actual results, level of activity, performance or achievements of the Largo to be materially different from those expressed or implied by such forward looking statements, including but not limited to those risks described in the annual information form of Largo and in its public documents filed on SEDAR from time to time. Forward ‐ looking statements are based on the opinions and estimates of management as of the date such statements are made. Although management of Largo has attempted to identify important factors that could cause actual results to differ materially from those contained in forward ‐ looking statements, there may be other factors that cause results not to be as anticipated, estimated or intended. There can be no assurance that such statements will prove to be accurate, as actual results and future events could differ materially from those anticipated in such statements. Accordingly, readers should not place undue reliance on forward ‐ looking statements. Largo does not undertake to update any forward ‐ looking statements, except in accordance with applicable securities laws. Readers should also review the risks and uncertainties sections of Largo's annual and interim MD&As. The Company uses certain non-GAAP financial performance measures in its MD&A, which are described in the following section. The Company's MD&A refers to cash operating costs per pound produced, a non-GAAP performance measure, in order to provide investors with information about a key measure used by management to monitor performance. This information is used to assess how well the Maracás Menchen Mine is performing compared to plan and prior periods, and also to assess its overall effectiveness and efficiency. Cash operating costs includes mine site operating costs such as mining costs, plant and maintenance costs, sustainability costs, mine and plant administration costs, royalties and sales, general and administrative costs, but excludes depreciation and amortization, share-based payments, foreign exchange gains or losses, commissions, reclamation, capital expenditures and exploration and evaluation costs. These costs are then divided by the pounds of production from the Maracás Menchen Mine to arrive at the cash operating costs per pound produced. The measure, along with revenues, is considered to be one of the key indicators of the Company's ability to generate operating earnings and cash flow from its Maracás Menchen Mine. These cash operating costs do not have any standardized meaning prescribed by IFRS and differ from measures determined in accordance with IFRS. They are intended to provide additional information and should not be considered in isolation or as a substitute for measures of performance prepared in accordance with IFRS. These measures are not necessarily indicative of net earnings or cash flow from operating activities as determined under IFRS. In addition, the Company's MD&A refers to cash operating costs excluding royalties. This is a non-GAAP performance measure and is calculated as cash operating costs less royalties, as disclosed in the following tables. The following tables provide a reconciliation of cash operating costs per pound produced for the Maracás Menchen Mine to operating costs, excluding depreciation expense as per the 2018 audited consolidated financial statements. Calculated as the amount for the Company's Mine properties segment in note 17, less the amount disclosed for the Mine properties segment for the nine-month period in note 16 of the Company's unaudited condensed interim consolidated financial statements for the three and nine months ended September 30, 2018: $135,746 – $98,109 = $37,637. Calculated as the amount for the Company's Mine properties segment in note 17, less the amount disclosed for the Mine properties segment for the nine-month period in note 16 of the Company's unaudited condensed interim consolidated financial statements for the three and nine months ended September 30, 2018: $9,680 – $7,068 = $2,612. Calculated as the amount for the Company's Mine properties segment in note 17, less the amount disclosed for the Mine properties segment for the nine-month period in note 16 of the Company's unaudited condensed interim consolidated financial statements for the three and nine months ended September 30, 2018: $3,759 – $1,411 = $2,348. Calculated as the amount per note 22, less the amount disclosed for the nine-month period in note 20 of the Company's unaudited condensed interim consolidated financial statements for the three and nine months ended September 30, 2018: $31,031 – $23,684 = $7,347. Calculated as the amount per note 22, less the amount disclosed for the nine-month period in note 20 of the Company's unaudited condensed interim consolidated financial statements for the three and nine months ended September 30, 2018: $22,678 – $13,720 = $8,958. Refer to note 22 in the Company's annual consolidated financial statements for the years ended December 31, 2018 and 2017. Refer to the Mine properties segment in note 17 in the Company's annual consolidated financial statements for the years ended December 31, 2018 and 2017. Largo reports non-GAAP measures such as "Cash Operating Costs" and "Net Debt". Please see information on this non-GAAP measure in the "Non-GAAPMeasures" section of this new release. Excludes corporate SG&A or CAPEX (Capital Expenditures). Refer to Management's Discussion and Analysis for the year ended December 31, 2018 for exchange rates used. Largo reports non-GAAP measures such as "Cash Operating Costs" and "Net Debt". Please see information on this non-GAAP measure in the "Non-GAAP Measures" section of this new release.